Our Lawn is Fit For Bare Feet Thanks To TruGreen and Summer Lawn Care Tips To Make Your Lawn Barefoot Friendly! I was provided with TruGreen Lawn Service to facilitate this post. All thoughts and opinions are my own. So, lets rewind back to the end of Spring. Back to a time when my lawn looked absolutely horrific. See, both of our neighboring houses on either side of us stopped taking care of their lawns. One house foreclosed and one had renters that apparently just didn’t care what the lawn looked like and our lawn paid the price. The weeds spread over from the westerly winds and took root in our once beautiful yard. Last year we tried to take care of our weed and grub problems ourselves but didn’t see much, if any, results. The weeds would seem to die off but sprout right back up in another spot. The only thing that did work was the grub killer. Our lawn still looked horrible. This year I decided it was time to leave our lawn to the professionals and was lucky enough to be offered to review TruGreen lawn service. TruGreen offers 3 plans for routine lawn care – TruMaintenance Lawn Plan, TruHealth Lawn Plan and the TruComplete Lawn Plan. We have the TruGreen’s TruHealth Lawn Plan. So far this year they have been out 4 times and each time our lawn looks better and better. The weeds are gone and it is quickly becoming worthy of running on barefoot which we would never dare do before with all the prickly weeds and crabgrass. Our front lawn is gorgeous and lush and our backyard (which was in WAY worse condition) is much improved with just a bit of crabgrass that they treated again a week ago. We have some bare spots that we need to seed but all in all our lawn is 97% better and I’m very pleased! I’ll let these before and after photos speak for themselves. It’s quite the difference! And this is our front yard, it’s so full and lush! I love it! If your looking for great lawn care I would highly recommend TruGreen. Visit the TruGreen website to sign up today. Follow TruGreen on Facebook for the latest updates & promotions! How is your lawn doing this summer? Is it barefoot friendly? Wow your lawn looks amazing. My yard is terrible. We live in the country and have a mix of shade and sun so finding the right grass seed is hard and expensive. And did you know they have annual grass seed? How only wants their grass to grow one year? I had no idea until I started comparing why some grass seeds are cheaper than others! Annual grass seed?! That makes no sense to me either! Grass seed is so expensive too! We’ll be putting some down to seed the few bare spots left so we’ll be sure NOT to buy annual seeds 🙂 LOL! Thanks for the compliment on my lawn, it’s come so far and I’m so happy with the results. Wow! That’s quite a difference! I love being able to go barefoot outside! I am paying close attention to this! The last homeowner before we just moved into this new house used Roundup all over the lawn for weeds and our lawn is brown! I am trying so hard to nurse it back and weather has been so hot! Wow! I can’t believe the difference in your before and after pics. That’s amazing. Love the infographic. Lots of helpful information in it! Thanks for sharing. It is quite the difference isn’t it?! 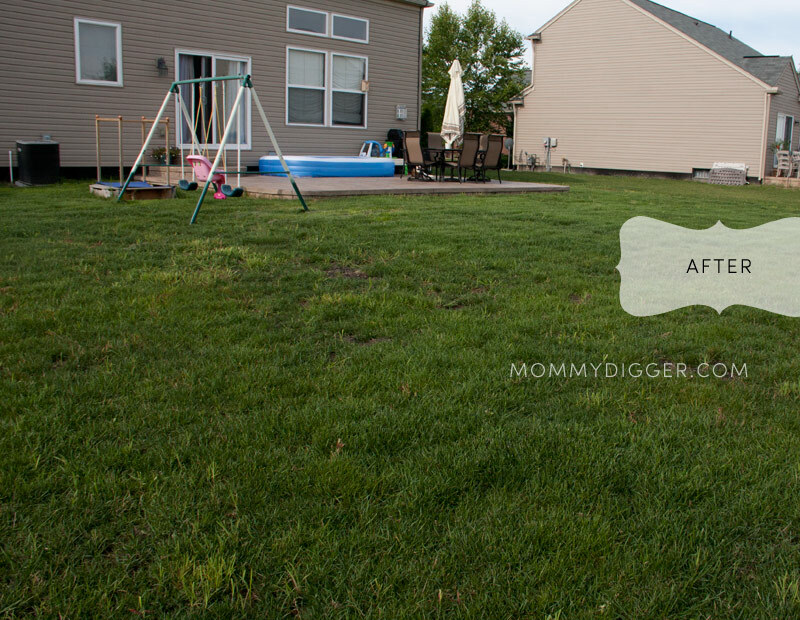 I knew there was quite the difference but after opening up both the before and after pics I was blown away, man my grass was totally horrific before, not anymore! It looks beautiful and does look like my feet would love it! Beautiful yard for kids. TrueGreen Lawn Service looks like it really works well. My lawn looks like the first pictured lawn. How I wish I could have a full and lush lawn. Living in Florida we get horrible fire ants 🙁 they are so hard to eradicate from the yard :(. Your lawn looks great! Wow what a difference! I love the result. I wish we could have grass like that in South Florida. It looks so soft not like here where it is crunchy feeling, I hate going barefoot in it! Thanks for stopping by my blog yesterday. Wow, what a difference in your lawn. It looks amazing! Looks really great! It’s amazing how little changes can make a big difference. Wow that is quite the difference! Your before-grass pictures looks like our current issue. Thanks for the tips/advice! we use trugreen and they have made a huge difference in how our lawn looks! Your lawn is beautiful! Plush and green. Yes, it’s a lawn you want to walk barefoot in. I wish mine was there. We try to seed and kill the weeds but can’t seem to get control of it. I will have to look into their lawn plans. Yours is a great showing for them!